Amazon Giveaway: Slime Putty Toy Kit 18pc Multi Pack. Magic Crystal Scented Fruit Themed, Super Stretch Gel Soft, Water Based Toy Set. Fluffy for Kids, Adults, Birthdays, Parties. Stress Relief, Non-Toxic. Slime Putty Toy Kit 18pc Multi Pack. 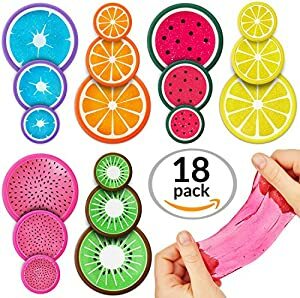 Magic Crystal Scented Fruit Themed, Super Stretch Gel Soft, Water Based Toy Set. Fluffy for Kids, Adults, Birthdays, Parties. Stress Relief, Non-Toxic.